The new EZiCAT i-Series range of locaters simplify the process of searching for buried cables and utility services. Incorporating many unique features not seen on other locating devices the EZiCAT will enable you to help reduce user error and speed up the onsite survey process. The EZiCAT i500 locates buried services by receiving electromagnetic signals which radiate from them. The EZiCAT’s intelligent software interprets the signals and provides the operator with an audible and visual response to the position and direction of the buried services. With standard detectors you are constantly adjusting the sensitivity of the unit as you pass over the services continually reducing the sensitivity. With the EziCAT you simply pass over the service until the signal strength starts to reduce. As you move the locator back over the service it will automatically adjust the sensitivity until the exact location is shown. As you continue your survey the EZiCAT will automatically adjust back to the most suitable sensitivity. 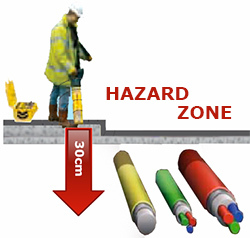 The new Hazard Zone function provides an additional visual & audible warning of buried services close to the surface (within approximately 30cm) alerting users to the immediate danger posed. SSI – Signal strength bar graph and numerical number make locating much simpler and more accurate than detectors relying on sound alone. SSI allows the user to trace an individual service amongst a multiple of services thus ensuring that you can follow the service without straying onto another. Sonde Detection - The i-Series feature a numeric signal strength readout, specifically designed to make Sonde location simpler. In-built Test Function - allowing operators to test the hardware and software functionality of the EZiCAT before use. Typically used to locate electrical services. This method of detection is known as a passive, as the signal may already be on the service Traces signals originating from distant radio transmitters. These signals penetrate the ground and are radiated by buried conductive services. Typically used to trace specific services, which may not have a passive signal on them. This frequency is the industry standard with most manufacturers using it. This method of detection is known as active, as you are applying a signal to a service Typically used to trace specific services, which may not have a passive signal on them. This frequency is more likely to go further than 33kHz however there is reduced cross coupling so other services close by may not be visible. Traces signals originating from distant radio transmitters. These signals penetrate the ground and are radiated by buried conductive services. Typically used to trace specific services, which may not have a passive signal on them. This frequency is more likely to go further than 33kHz however there is reduced cross coupling so other services close by may not be visible. Delivers the benefit of combined Power & Radio modes. Good for initial site occupation.